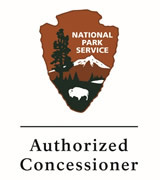 Ortega National Parks specializes in the retail and hospitality industries and operates retail stores, National Park Service concessions, restaurants, and hotels. As a family, we have seven generations of retail experience and over twenty years of experience as national park concessioners. In the National Parks, we pride ourselves on working as partners with the National Park Service in preservation of assets and interpretation of park features to visitors. We take pride in all of our concession operations and do not hesitate to re-invest in order to offer the best possible park experience to every visitor we serve as well as take care of the buildings and grounds in our custody with respect to their historic dignity.